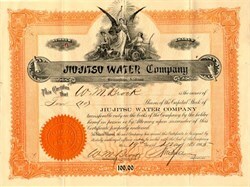 Beautiful certificate from the Jiu-Jitsu Water Company issued in 1905. 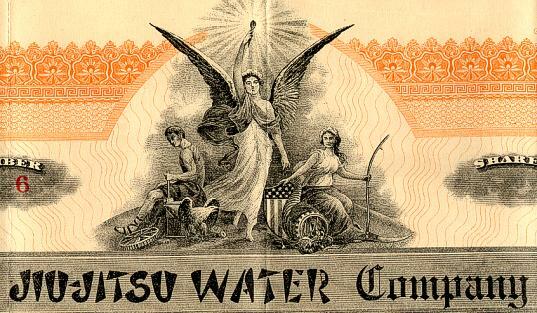 This historic document has an ornate border around it with a vignette of an three allegorical people with the company's name in Japanese style print. This item has the signatures of the Company's President and Secretary, W. M. Brock and is over 108 years old. This is a very unusual name especially from a Birmingham, Alabama company in 1905. Ju-jitsu (or Yawara) is an ancient Japanese Martial Art. Its origins date back to the sixteenth century when legend narrates that its founding father, a young Japanese man called Shirobei Akiyama who was studying medicine in China , witnessed a heavy blizzard. He was able to appreciate how branches of most trees broke while the elastic branches of the Willow tree bent and efficiently freed themselves from the snow. The Gentle Art or Art of Subtleness (for this is the meaning of Ju-Jitsu) would not aim to neutralize power with power but rationally absorb an attack and convert that energy to the opponent's own detriment. This basic principle became the heart of the teaching of the Yoshin ryu school, founded by the Akiyama and considered to be the foremost Ju-jitsu dojo. The Golden Age of Ju-jitsu lasted until 1869, date in which the Emperor's return to Japan and the subsequent abolition of Feudalism made the Samurai lose their status of privileged class. Samurai tradition nevertheless kept Ju-jitsu alive and travellers brought the Art to all four corners of the world.